The principal lobes of the brain, include the frontal lobes, temporal lobes, occipital lobes, parietal lobes, brain stem and cerebellum. The brain has two different hemispheres and all of the principal lobes of the brain exist bilaterally. For example, there is a right frontal lobe and a left frontal lobe. Likewise with the other lobes shown here. The principal lobes of the brain are shown here. The principal lobes of the brain are named for the plates of the skull which cover them. As can be seen above, the principal lobes of the brain, as almost all of the surface area of the brain, have numerous folds. The folds create ridges and valleys on the surface area, substantially increasing the total surface area. The ridges are called gyri. The valleys of the brain are called sulci. The deeper grooves between some gyri are called fissures. To the degree you want to understand the geography of the brain, these terms can be helpful because it is specific gyri and fissures that divide the principal lobes from each other. The frontal lobes are above the temporal lobe and are divided from the temporal lobe by the lateral cerebral fissure. The frontal lobes are in front of the parietal lobe and are divided from the parietal lobes by the central sulcus (fissure of Rolando). The parietal lobes are behind the frontal lobes and above the temporal lobes. 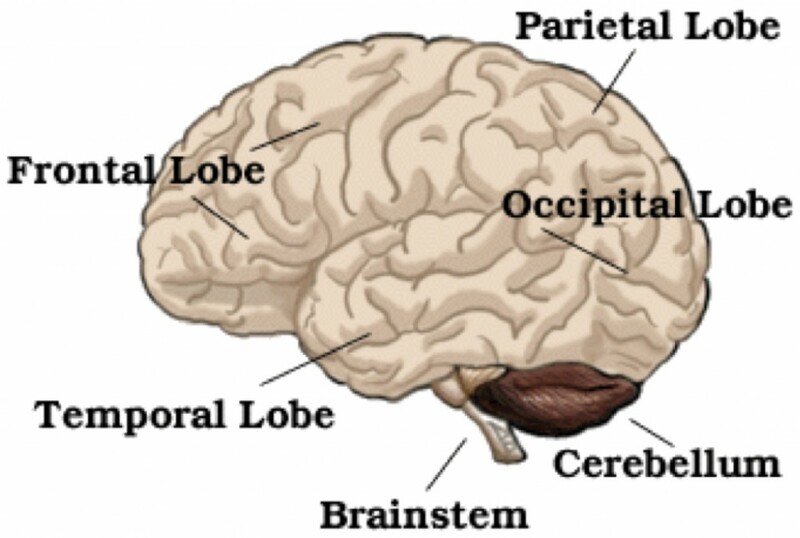 The pariental lobes are divided from the occipital lobe by the parieto-occiptal fissure. Like the frontal lobes, the parietal lobes are separated from the temporal lobes by the lateral cerebral fissure.